You know the saying "Great things come in small packages"? Oftentimes those words of wisdom apply to all things Chanel — the designer's tweed stitching, tiny bottles of perfume, and delicate pearls. Well, for the first time ever the French house is getting the go-big-or-go-home treatment, via a Steinway & Sons piano. 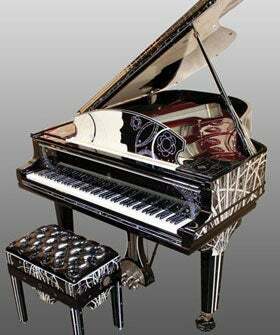 CustomMade artisan Gene Korolev crafted the $250,000 instrument in his North Hollywood studio. Embellished with a hand-painted silhouette of Coco herself, 48,500 brilliant-cut, inlaid cubic zirconium (the phony jewels are quite fitting since the designer favored costume pieces over the real deal! ), and painted a deep red in honor of her ever-popular rouge, the homage is unlike any other in the history of opulent odes. Did we mention that it comes with a custom upholstered bench and can be played wirelessly using your iPad? The entire package, like a 2.55 purse! Interested in making the investment? Click on over and prepare to to be in awe of this man's insane craftsmanship. Honestly, we'd be happy to afford just one of those bedazzled keys!